The largest wooden fire-proof hall in Japan "Nanyo-City Cultural Center"
In Yamagata Prefecture, Nanyo City, "Nanyo-City Cultural Center" was completed. It has the largest wooden hall in Japan. The basic philosophy of this architecture is "Creative hub of arts and culture for citizens to encourage a variety of exchanges". We used locally-grown cedar in large quantities, from the structure of the building until the finishing material. Main Hall is dynamic and warmth of wood by state-of-the-art fire-proof technology. It has excellent acoustic performance just like musical instruments. For people, for the city. We will send to the whole country a new artistic culture from Yamagata. 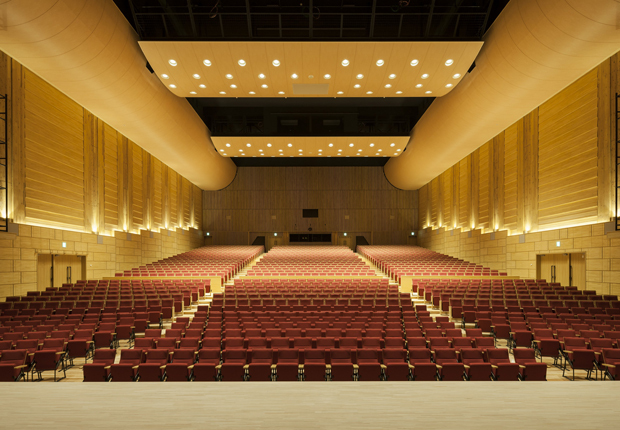 Guinness World Records "Largest Wooden Concert Hall"
Main Hall of Nanyo-City Cultural Center has been registered as “Largest wooden concert hall” by Guinness world records in December 21th, 2015. The hall has a total seating capacity of 1,403, which is the numeric value in this record.